﻿ Welcome to Luxor Construction LLC, providing siding services from Portland, Or. Copyright © Luxor Construction LLC, 2012. All rights reserved. Family owned and operated since 1999. Our focus is on QUALITY and CUSTOMER SATISFACTION. We are a company of professionals who take pride in what we do. Our employees are experienced and are trained to provide you with the solutions you need, at prices that help you stay within your budget. Our Pride in the Quality of Our Work is Evident in the Results We Provide. Need to replace your old L.P. Siding? Want to give your house a face-lift? Mauricio was born and raised in Costa Rica. He came to the Unites States in 1994 and began learning the construction business. He was a siding supervisor for three years before starting his own business, LUXOR CONSTRUCTION in 1999, which later became LUXOR CONSTRUCTION, LLC in 2007. Mauricio is licensed as a general contractor with the state of Oregon and Washington. "Coming from a small farm in Costa Rica, I believe in honesty, integrity and quality work. 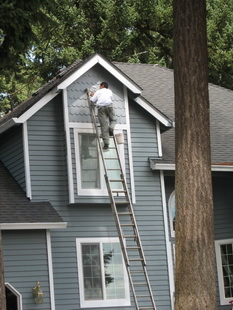 Unlike our large competitors, we are a small company that specializes in siding replacement and exterior painting. When you call, you will be given customized individual attention. As a usiness owner, my goal in every job is to make the customer happy." All of our employees are covered by worker's compensation insurance and we carry $1 million liability insurance so that our workers and your property are fully covered. Cedar Siding Traditional cedar siding is a favorite in the Northwest as it stands up well in our wet climate. Cedar Shingles Cedar shingles are often used in the gales or on the front of the house to add curb appeal, ut it can also be used to side the entire house. HardiePlanktm and HardiePaneltm Vertical Siding This fiber-cement comes in a variety of textures, has a manugacturer's 50-year limited warranty and is less expensive than cedar siding. HardieShingletm Siding Hardieshingles are fiber-cement siding that can be used as a primary siding or to add a decorative touch to the front of your home. It comes with a 30-year limited warranty. Our Focus Is On Quality! "We were so pleased with the siding replacement Luxor did on our 1st house that when it came time to replace the LP siding on our second house, there was no need to accept bids form other contractors. We knew we could expect a no-stress, outstanding result like before." "Years of experience with contractors of all types have taught us to recognize those with skill and integrity. Luxor Constructioon and Mauricio exceed all expectations!" "Mauricio Villalobos is simply the best contractor I have ever dealt with. He is the only contractor I have ever dealt with who has given me 150% of what I bargained for." "Luxor Construction did an excellent job on our home. They provided a high quality product, on time, on budget with great customer service. A real pleasure to work with."